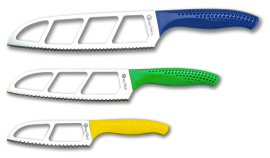 The double scalloped serration makes each knife an easy-cut knife. Enjoy cutting and chopping ease with our no-stick knife design. All Easy Slice knives function just as well when used as a left-handed knife. Cutting everything properly can be the difference between a great meal and a failure. But how do you cut everything properly with a knife that doesn’t cut straight? If you have trouble slicing evenly because of your knives, it’s time to try Easy Slice! Our double scallop serrated edge knife is an all-purpose knife, designed to function as a left-handed knife just as well as it would for right-handed use. In addition, the zero friction no-stick knife blade means this knife won’t get stuck halfway through the job. 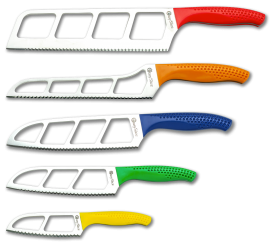 Experience the ease for yourself; order the best serrated knife from Easy Slice today!